I was recently invited to attend a workshop held by the Centre for Evidence-Based Medicine in Oxford. This wasn’t a formal demonstration of TRIP, it was more an informal chat to allow people to ask about TRIP various aspects of TRIP e.g. How often is the site updated? Answer: most content is weekly or fortnightly and the rest on a monthly basis. What is involved in updating the site? Answer: Most content is automatically added via various clever bits of technology. However, for a number of sites I still have to visit them monthly and manually add the content. How does the boolean work? Answer: Use the advanced search to show you – as this builds the boolean for you. It’s an interesting issue/problem. It’s trying to get the balance right between making features visible and not over-powering. I’m really not sure how to resolve this! Possibly create a monthly ‘Feature’ area which would allow me the ability to focus on a given feature. One to ponder! 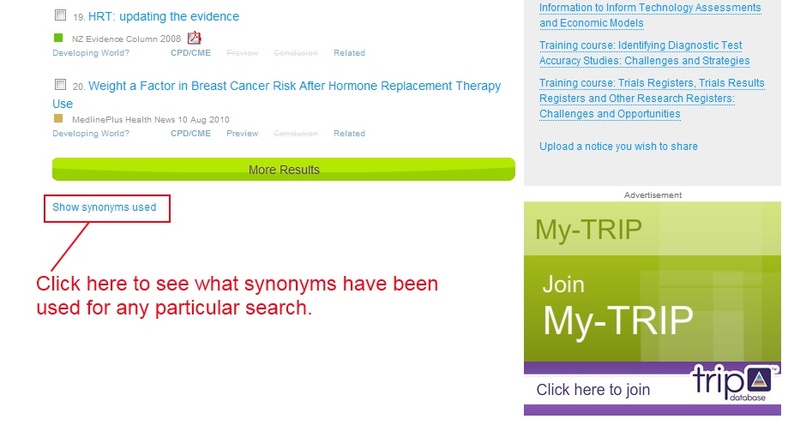 As you well know I'm a great fan of TRIP and regularly use the free text search on clinic with my students. They're always impressed with the ease of use and the fun colours! I found it easy, personally, to explore the other functions Trip offers but then, I find it fun exploring… not much use I'm afraid.